Byrne Gas was established in 1979 by Pat and Paula Byrne and have been serving the people of Waterford City and county ever since. We are a specialist heating, plumbing, installation and service business located in 52 The Glen, Waterford. 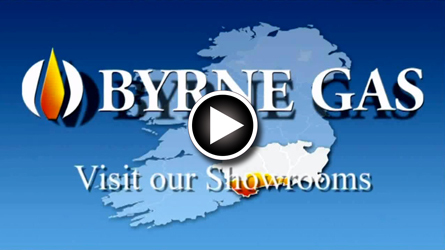 Byrne Gas is an established market leader in the South East region of Ireland. We offer a high quality workmanship and a wide range of services, which include installing new central heating systems, converting old systems, boiler replacements, plumbing, servicing, maintenance as well as sales and installation of gas appliances. We also offer an unbeatable after sales service. All our staff are highly skilled, insured and qualified in accordance with the National Standards of Authority of Ireland. All systems are installed to IS813 and RGII approved standards. And because Quality, Safety & Customer Care are of paramount importance all installations are carried out directly by Byrne Gas personnel. Our company operates an Energy Supply Store for the retail of gas and renewable energy products and a natural gas installation, service and maintenance business. Customers visiting the showrooms can expect a large variety of established Natural Gas and L.P.G appliance brands, allowing you to choose the best appliance from contemporary to traditional styles with the added comfort and expert advice from our in-house sales team. The gas showrooms are fully stocked with a fantastic selection of appliances, gas boilers state of the art gas fires, cookers and hobs, tumble dryers, solar panels and underfloor heating. Familiar brands to be found at the Byrne Gas energy supply store are names that have become relied upon by thousands of satisfied customers nationwide like Vokera, Ideal, Flavel, Valor, Faber, Wonderfire, NuFlame, Cannon, Indesit, Beco, Stoves, Candy, NewWorld. With a reputation built up over many years, Byrne Gas has been synonymous with quality reliability and aftersales in the central heating and gas appliance sales market, which is why, when you choose to deal with Byrne Gas, you make a very wise decision. 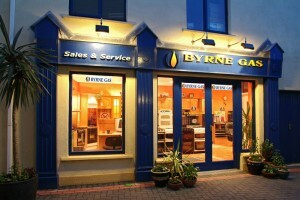 Byrne Gas is a market leader in the south east of Ireland. 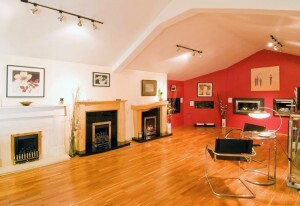 Visit our showrooms for a large variety of gas and renewable energy products. See our new exclusive range of super efficient gas fires, each with an incredible 89% efficiency and impressive 4 kilowatt heat output. Running costs are as little as 12.5 cent per hour. You can choose from manual, slide or remote control options. No mess, just instant heat when you want it at the flick of a switch, at a price you can afford.